When SAML is enabled, the principal (an Edge UI user) requests access to the service provider (Edge SSO). Edge SSO then requests and obtains an identity assertion from the SAML identity provider (IDP) and uses that assertion to create the OAuth2 token required to access the Edge UI. The user is then redirected to the Edge UI. Edge supports many IDPs, including Okta and the Microsoft Active Directory Federation Services (ADFS). For information on configuring ADFS for use with Edge, see Configuring Edge as a Relying Party in ADFS IDP. For Okta, see the following section. To configure your SAML IDP, Edge requires an email address to identify the user. Therefore, the identity provider must return an email address as part of the identity assertion. Note: You must use apigee-saml-login-opdk as the SPI entity ID. You cannot change it. 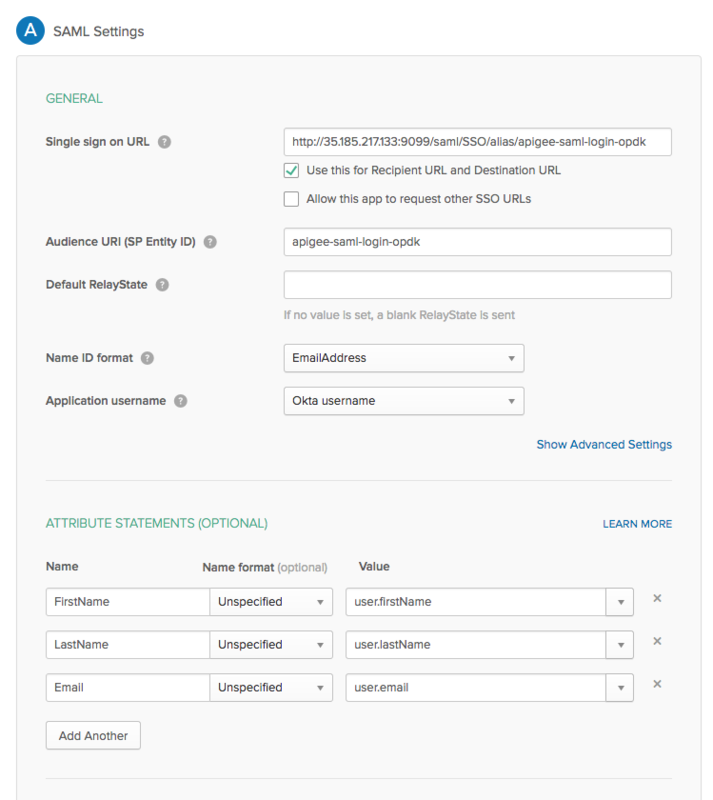 Select Applications and then select your SAML application. Select the Assignments tab to add any users to the application. These user will be able to log in to the Edge UI and make Edge API calls. However, you must first add each user to an Edge organization and specify the user's role. See Register new Edge users for more. Select the Sign on tab to obtain the Identity Provider metadata URL. Store that URL because you need it to configure Edge. Where apigee_sso_IP_DNS is the IP address or DNS name of the node hosting apigee-sso. Note that this URL is case sensitive and SSO must appear in caps. If you have a load balancer in front to apigee-sso,then specify the IP address or DNS name of apigee-sso as referenced through the load balancer. Use this for Recipient URL and Destination URL Set this checkbox. Default RelayState Can leave blank. Name ID format Specify EmailAddress. Application username Specify Okta username. Attribute Statements (Optional) Specify FirstName, LastName, and Email as shown in the image below.